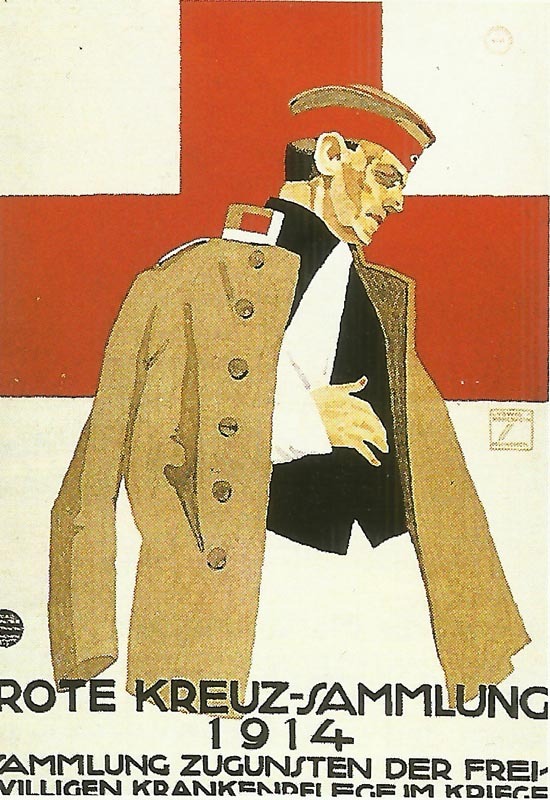 Poster of the Austria-Hungarian Red Cross collection of 1914. Joffre and Field Marshall French confer at Chantilly. Artois: 10 Chasseurs de Alpins battalions capture 800 yards of Bavarian trenches at La Targette after 2­ hours artillery preparation. Flanders: Belgians take German trenches near Lombaertzyde. Vosges: ­Germans bombard St Die. Conrad cables Falkenhayn ‘Complete success in the Eastern theatre is . . . extremely urgent’. Tsar at STAVKA (December 26­-29), inspects new 53rd Don Cossack Regiment on December 28. Poland: ­Germans beaten on river Ravka. Armenia: Turks repulsed from Sarikamish; Turkish 28th Division reaches but driven off Kars road. Cameroons: Lieutenant J P Butler wins African land war’s first Victoria Cross (awarded 23 August 1915) by swimming across river Nkam under fire.